The prices of mainstream consumer SSDs have fallen dramatically every year over the past three, and by 2017 they are expected to be within 11 cents of the per-gigabyte price of hard disk drives (HDDs). The plummeting prices have also driven the recent adoption of SSDs in laptops. This year, they will be used by manufacturers in about 24% to 25% of laptops, according to a new report by DRAMeXchange, a division of market research firm TrendForce. Next year, SSDs are expected to be in 31% of new consumer laptops, and by 2017 they'll be in 41% of them, according to DRAMeXchange senior manager Alan Chen. This marks the fourth straight quarter that the SSD price decline has exceed 10%. But, as popular as they've become, the adoption rate will fall below expectations this year, DRAMeXchange stated. "Branded PC vendors and channel distributors are holding back on their SSD purchases due to lower-than-expected notebook sales," Chen said. "However, 256GB SSDs will be moving close to price parity with mainstream HDDs in 2016, so the adoption of SSDs in the business notebook segment will rise." The per-gigabyte pricing of hard disk drives and SSDs. While SSD pricing has dropped dramatically over the past three years, HDD pricing hasn't. From 2012 to 2015, per gigabyte pricing for HDDs dropped one cent per year from 9 cents in 2012 to 6 cents this year. However, through 2017, the per-gigabyte price of HDDs is expected to remain flat: 6 cents per gigabyte. That means a 1TB hard drive will continue to retail for an average of about $60, though they can be found for under $45 on many online retail sites. By comparison, consumer SSDs were selling for 99 cents a gigabyte in 2012. From 2013 to 2015, the price dropped from 68 cents to 39 cents per gig, meaning the average 1TB SSD sells for about $390. Next year, SSD prices will decline to 24 cents per gigabyte and in 2017, they're expected to drop to 17 cents per gigabyte, Chen said. That means a 1TB SSD on average would retail for $170. Consumer SSD shipments in the third quarter (including those from the retail SSD market) reached a total of 21.6 million units. Third-quarter shipments of notebooks worldwide rose to 43.3 million units, up 13% from the previous quarter on account of peak seasonality, according to DRAMeXchange. In the retail SSD market, channel distributors were conservative in their restocking efforts in the third quarter because they had expected NAND flash prices to drop further. Therefore, the retail SSD market's total shipments in the last quarter were disappointing by peak quarter standards, rising only slightly, Chen said. Fourth quarter is the traditional peak sales season in the U.S. and European markets. Chen noted that while MacBook sales continue to grow and non-Apple branded notebooks with Intel's Skylake CPUs have hit the market, quarterly notebook shipment growth will still be constrained by ongoing inventory adjustments. DRAMeXchange expects the SSD adoption rate in the laptop market to move up a bit to about 28% during the same period. Since the decline in NAND flash prices and aggressive pricing from SSD suppliers show no signs of stopping, the retail SSD market will deviate from the seasonal pattern in the fourth quarter; global Client-SSD shipments are likely to see a slight quarterly increase of 4% to 6%. In order to consume more capacity and gain market share, NAND flash suppliers such as Samsung, Toshiba, SK Hynix, Intel and Micron will maintain their aggressive pricing strategy into the first half of 2016, DRAMeXchange said. In terms of SSD product strategy, Samsung will continue to use the price advantage it has with its 3D triple level cell (TLC) SSD and DRAM-less SSDs to gain more PC-maker market share. However, SanDisk is quickly catching up and has started mass production of its own lines of TLC-SSD and DRAM-less products since the middle of this year. Other SSD manufacturers are rolling out products using 15 nanometer (nm) and 16nm-based multi-level cell (MLC) flash in response to the aggressive pricing of NAND flash memory. Chen noted that the price war in the NAND flash market will continue into the first half of 2016 as major NAND flash suppliers work hard to consume capacity and capture market share. 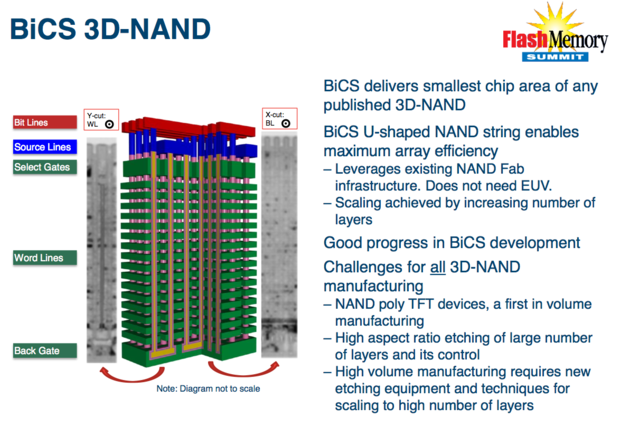 Toshiba and SanDisk's Bit Cost Scaling (BiCS) 3D vertical NAND design.